"Lots of people have talked about taking that step into the unknown. Taking that step into the unknown is actually a lot less courageous than taking a step from the unknown." I am indebted to Ofelia Fonts and to Jacqueline Gomez and to Mary Symmonds and to Sam Lemay who inspired this conversation, and to Ofelia Fonts and to Sam Lemay and to Carol Ann England who contributed material. Werner's work is coming to the Dominican Republic. I've been to the Dominican Republic. It was soon after I graduated from the est Training in the last weekend of August 1978. I was on a freighter on the Mississippi River sailing from New Orleans, Louisiana, USA across the Caribbean Sea then the Atlantic Ocean to Cape Town, South Africa, stopping at ports along the way. 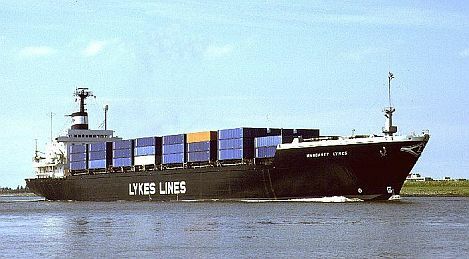 The freighter, the Margaret Lykes, carried cargo, some of which was destined for Hispaniola, the island home of the twin countries Haiti and the Dominican Republic. She also needed to load outbound freight there. We moored in the Port‑au‑Prince docks on the west side of Hispaniola in Haiti at what was a primitive yet adequate dock, unloaded some containers and loaded some new ones. The ship's captain, "Logbook" Wilson, had received word of ongoing civil unrest (for which Haiti is infamous) in the Port‑au‑Prince downtown area, and so we went about our business quietly, not venturing too far from the docks until it was time to leave. Sailing around to the east side of Hispaniola to Santo Domingo, the capital city of the Dominican Republic, we put into what could hardly even be called a dock and which made the primitive facilities in Port-au-Prince seem state of the art and modern in comparison. The huge Margaret Lykes, sailed up a river until the crew spotted some stout trees on the bank. They literally tied the ship to a tree and set up a means to offload cargo using block and tackle to make a slide between the ship's deck and another tree on the river bank. It's the stuff of legends that when sailors reach port and they party, they party hard. The night we spent in Santo Domingo was, in character, partied hard. I had befriended two of the crew who worked in the engine room. Being experienced sailors, they knew where the action was in these parts. We took a taxi to a beachside nightclub comprising a half dozen or so grass huts, one of which was a saloon dispensing grog, the sailors' mainstay. There was live music by a local band and tiki lights, and there were women everywhere. They were beautiful - in a nubian, muscular, horsey kind of way. It was a night to remember. As dawn was breaking, we bade our swift and fond farewells, then took a taxi ride back to the Margaret Lykes which we boarded under the watchful, knowing eye of Captain "Logbook" Wilson, released our moorings from the tree, and set out once again for the open sea, charting a course for Cape Town where I would deliver the first ten guest events in South Africa, enrolling the first one thousand people around the country in the possibility of Werner's work coming to South Africa (today the Landmark Forum and Advanced Course and other Landmark programs are offered there on a regular basis). At that time, the possibility of Werner's work coming to the Dominican Republic wasn't yet on the radar. Or it was ... like a possibility. On Wednesday January 29, 2014 I made the following worldwide announcement to two thousand people plus by e-mail, inviting them to enroll in co‑generating with me the possibility of Werner's work coming to the Dominican Republic. Please notice at the time, the announcement was expressed as a work in progress. I'm thrilled, delighted, and very, very happy to announce the first introduction ever to Werner's work in the Dominican Republic! A team of dedicated graduates from the Dominican Republic and elsewhere have long considered the possibility of The Landmark Forum being offered in the Dominican Republic. The presentation of this introduction (in Spanish, translated into English if necessary) in the city of Santo Domingo, creates the possibility of The Landmark Forum in the Dominican Republic becoming real at last. Our intention for this introduction in the Dominican Republic is to enroll people to participate in The Landmark Forum in other countries until we build up the base of graduates and leaders in the Dominican Republic to offer a sustainable Landmark Forum and Advanced Course there on a regular basis. If you'd like to set your clocks and your listening to international time to support this historic event, Dominican Republic local time is four hours behind Greenwich Mean Time, one hour ahead of Eastern Standard Time, and four hours ahead of Pacific Standard Time. This introduction to The Landmark Forum is coming to the Dominican Republic because of Ofelia and Jacqueline and Mary and Sam among others, four of the many tireless sources standing for it. The idea of Werner's work thriving in the Dominican Republic in 2014, just like the idea of Werner's work thriving in South Africa in 1979, may be met at first with skepticism and derision. And when the Landmark Forum and Advanced Course and other Landmark programs are offered there on a regular basis, people will say "I said it was a good idea all along.". It's one thing going to the Dominican Republic. That's easy - even by freighter ie especially by freighter. It's another thing entirely coming from transformation, possibility, and enrollment in the Dominican Republic when there's no listening for it - which is to say when there's no listening for it yet. That's courageous. That's the team bringing Werner's work to the Dominican Republic.